"I want to help young people because they don't have anything to do. They cause trouble but they have a bright future ahead of them. I was helped. Now I want to give back, help someone else." He fled Iraq for the UK as a young child in 2004. "It was hard. I was brought up in a war zone." After a year in London Dasin moved to Coventry, in the Midlands. Many of his compatriots had relocated there but things were not easy. "In Coventry there aren't many opportunities. Most days my friends and I were in the park, messing about, sitting around, doing nothing. "A couple of friends used to cause trouble, be with a gang. People stay on their own, do drugs, because they get influenced by other bad people." 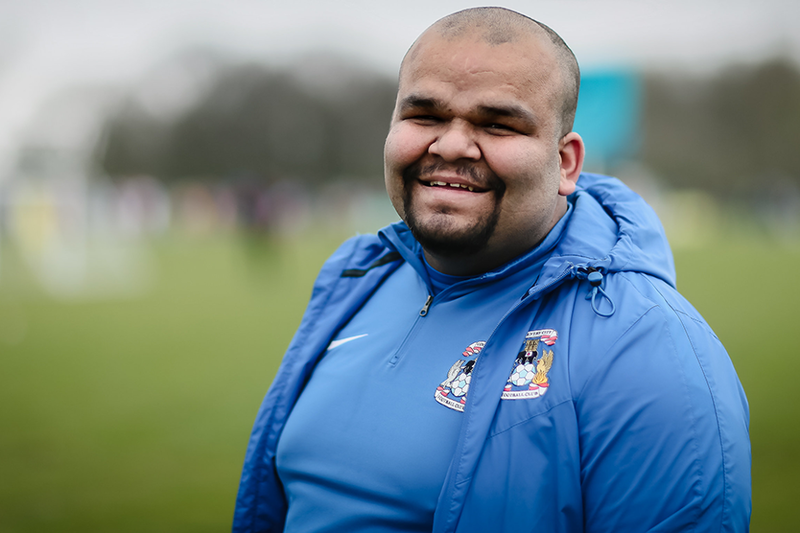 About seven years ago, Dasin and his friends were approached by a member of Sky Blues in the Community's Premier League Kicks programme who offered free football sessions. "We thought, 'We might as well try it.'" "After the first couple of sessions, I told all my friends. Everyone enjoyed it and now I'd estimate that around 100 or 200 people come. "Everyone comes along, meets each other, challenges each other in football, has competition. They take us to places too. We went to Birmingham and many other tournaments. We wouldn't have done that otherwise." It also recently took Dasin to Manchester for the PL Kicks Cup. Dasin was there as a volunteer for the Coventry City PL Kicks team in tournaments for mixed and girls Under-16 teams. He is keen to deepen his involvement with the programme and with Sky Blues in the Community, the registered charity of Coventry City FC. "I'm with them part-time as I'm doing plumbing. But I'm asking for a coaching course so I can get a full-time job with them. "I grew up with it so I want to stay with it. It's given me the hunger to be a coach now and help them out. "It means a lot to me. It's a very special programme. "Kicks works because they want to help the youth to stay out of trouble and enjoy their free time. I'd probably be in a different place without it. "I've got to meet new people, travel and know the language. It's taught me how to settle in the country. I can't believe how much I've developed."